The ground in Syracuse (NY) still has snow and the temperatures are still unseasonably cold from time to time, BUT the Sun crosses the Equator tomorrow and the first day of spring is here. 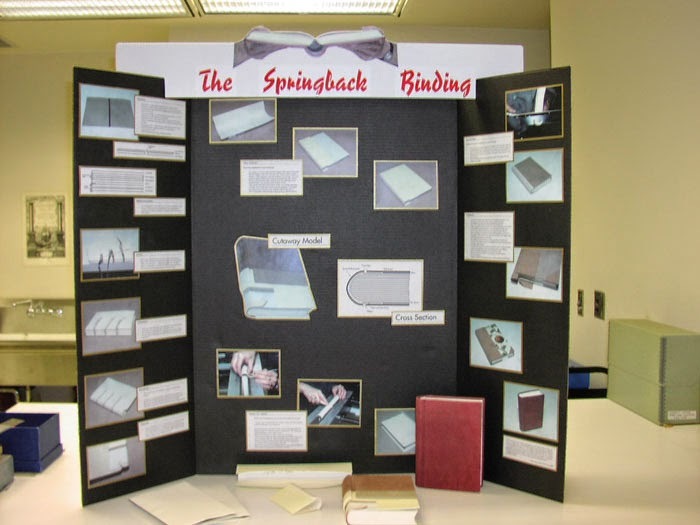 The days are getting longer, our clocks "sprung" forward in the US on the 8th, so why not "celebrate" one of my favorite binding structures, the springback. Above the logo for the first Bonefolder Bind-O-Rama (2004) that was featured on the cover of the Bonefolder. While published in the fall, the Bonefolder was announced early in the spring. Oben, das Logo für das erste Bind-O-Rama des Bonefolder von 2004. Das Heft kam im Herbst des Jahres zum ersten Mal heraus, wurde aber im Frühling angekündigt. And from the Bind-O-Rama, this miniature springback by Roberta Lavadour. 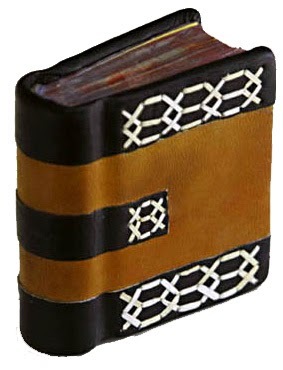 “A Counting” – English-style springback, leather cover with double straight bands laced with deer vellum. 600 pages of 9 lb. Canary paper with painted edges. Inscription notes the multiplier for each of the 300 page spreads needed to equal the number of dead and wounded American soldiers and Iraqi civilians since March 2003. 7.5 x 7 x 2.5 cm. Bound 2004. The mechanics of this springback reflect Richard Bakers demonstration at the Guild of Book Workers Seminar on Standards of Excellence in Hand Bookbinding in Denver CO, with a few references to Vaughans 1929 classic, Modern Bookbinding. The new purpose of this springback is to pop up the pop-up. The book measures 5.5 inches by 6.5 inches by 1.5 inches. Bound 2004. The structure is most common to the German and English binding traditions and has seen increased interest in the US since the early 2000s with articles and presentations largely by Peter D. Verheyen, Donia Conn, Richard Baker, and Karen Hanmer. 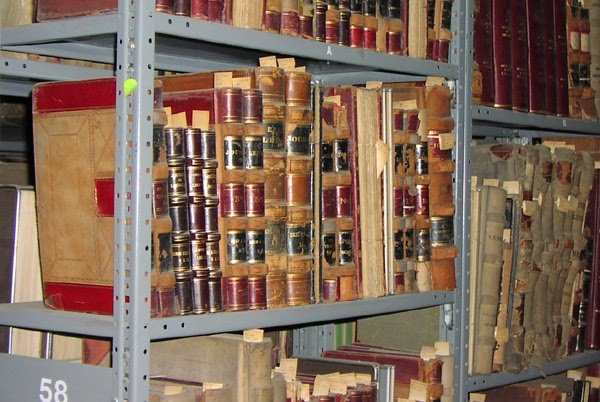 Sprungrücken gibt es am Häufigsten in der deutschen und englischen Buchbindertradition, und hat in den USA aber Anfang der 2000er neue Aufmerksamkeit gesehen in Aufsätzen, Vorführungen, und Kursen, hauptsächlich durch Peter D. Verheyen, Donia Conn, Richard Baker, und Karen Hanmer. Poster for the German tradition by Verheyen and Conn based on materials for our article in The New Bookbinder. Richard Baker "hammering over" the headcap for the English-style. Guild of Book Workers' Standards, Denver, CO 2003. The Springback: Instructions in the German tradition for a binding designed for account, ledger, and guest books. By Peter D. Verheyen and Donia Conn. 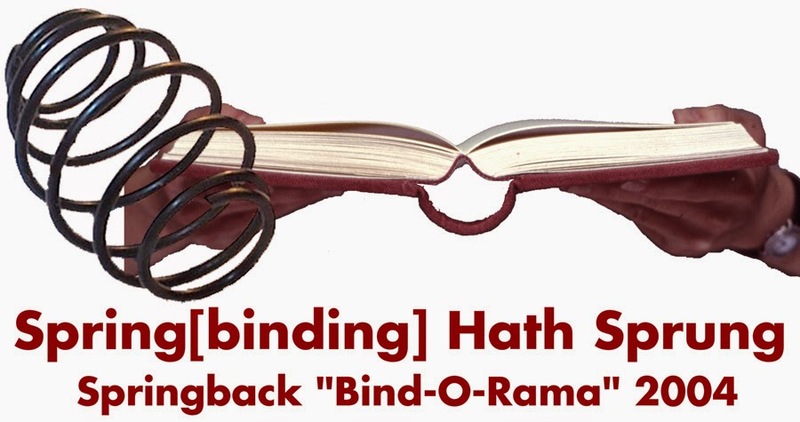 The Springback: Instructions in the English tradition for a binding designed for account, ledger, and guest books. By Peter D. Verheyen. 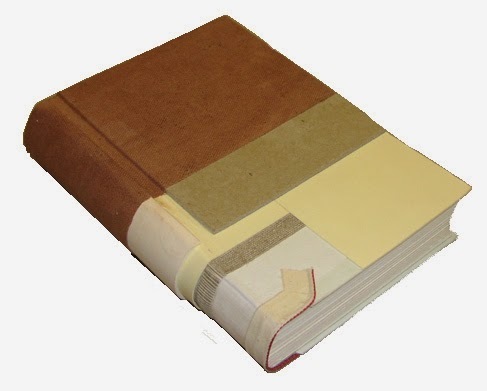 The structure is also described in all the leading bookbinding manuals published in German and in England. What's the attraction to this arcane structure that has long since been replaced by Microsoft Excel and now mostly sees use for guest books? It's the energetic springing flat of the pages as the book is opened that seem to give it wings. At left, "Not possible...," at right, "whoa! Wow!" 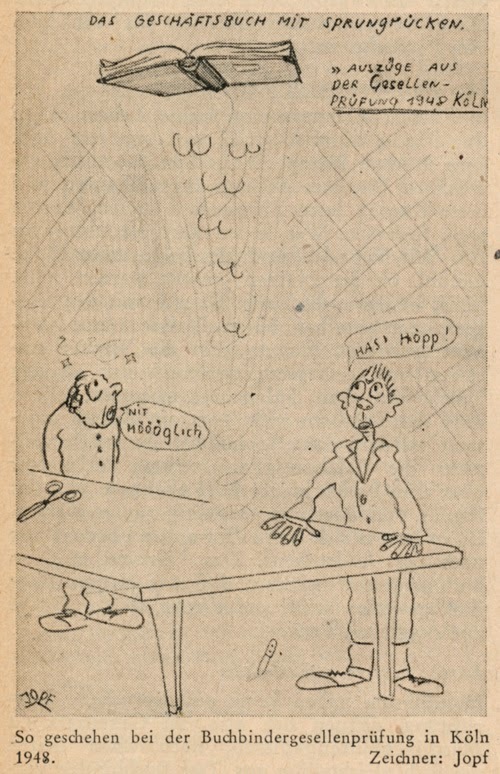 "As seen at the 1948 journeyman's exam in Cologne"
So, let's spring into spring with renewed energy! Also, ab in den Frühling mit erneuter Energie... ! Very delighted today to see Ernst Collin's Pressbengel translated into Japanese and appear on the web pages of the "Laboratory for Preservation, Conservation, and Restoration." 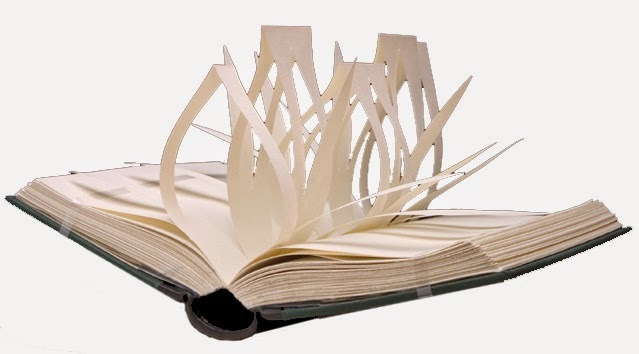 I had been contacted by Ms Satoko Noro last May about translating the work into Japanese based on my English translation as The Bone Folder, and was very pleased to say yes, because I feel the text has much to offer bookbinders and bibliophiles everywhere, and that it still as relevant as when first published in 1922. Their interest, the upcoming Boss Dog Press fine press edition with John (Hans) Schiff photographs taken at the Bremer Press, and my bibliography of Ernst Collin's writings, gave me the big push I needed to rewrite the introduction to my translation to that incorporates much of my research into the Collins. The Japanese translation appears in serialized form on their website, with the first monthly installment appearing just days ago. 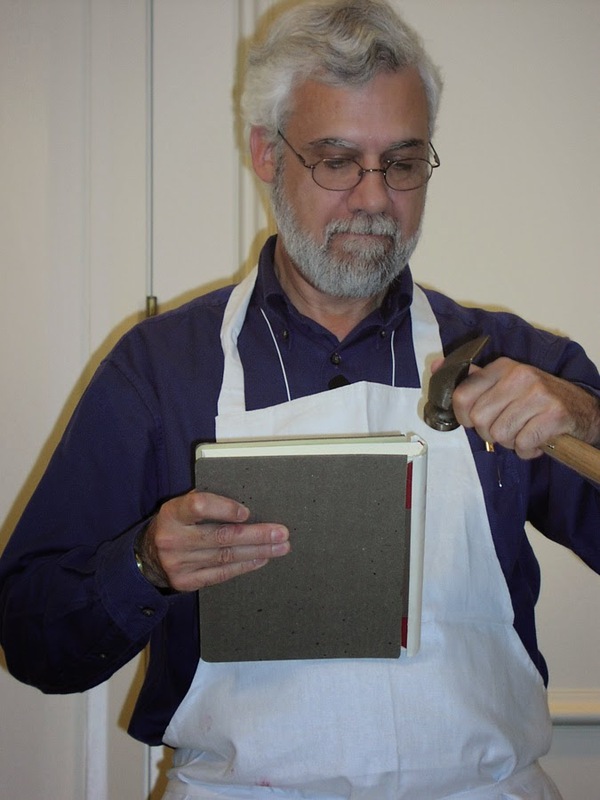 The translation is illustrated with photographs of bookbinding tools and bindings. Below a screen-grab of the first installment. A Google translation can be linked to here. Die japanische Übersetzung wird in monatlichen Folgen auf NPOs Webseiten veröffentlicht, und ist mit Abbildungen von buchbinderischen Werkzeugen und Einbänden illustriert. Unten ein Bild von der ersten Folge auf deren Webseite. Die Google Übersetzung gibts hier. There is also discussion of a more permanent (downloadable for reading or binding/Print-on-Demand), something I would love to see. Regardless, it is wonderful to see this level of interest in Ernst Collin's text, other writings, and family, this based on referring URL statistics from Japan and elsewhere. Es ist auch die Rede davon das ganze als dauerhafteres PDF zum Einbinden oder zum Lesen oder als Print-on-Demand zu veröffentlichen. Würde dies sehr gerne sehen, aber bin auf jeden Fall sehr froh über die Interesse an Ernst Collins Text, seine anderen Schriften, und an der Familie zu sehen wenn man aus Japan kommenden Webseitenanalytics betrachtet. Sowie Ernst Collin, so hatte Heinrich Lüers auch einen Doppelgänger zu Lebzeiten. Obwohl in verschiedenen Berufen, waren beide als Fachschriftsteller bekannt.